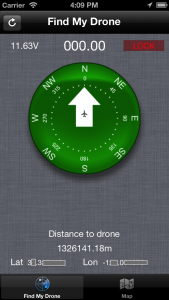 Pleased to announce today that my new App FIND MY DRONE is now available in the App Store. 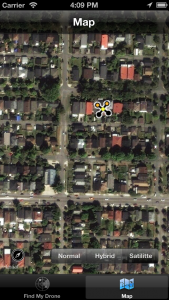 FIND MY DRONE is a FREE App that connects your iPhone to your personal UAV (unmanned aerial vehicle) using the popular MAVLink protocol. Watch this space, FIND MY DRONE will soon be followed by MAVPilot, a ground control station for your pocket. We’re currently undertaking Alpha trials for MAVPilot, if you’re interested in becoming a tester go here to sign-up. What ‘drone’ where you using? Did you have Find My Drone connected before it drifted away? It won’t automatically know the location unless it’s was connected. Forgive me for being a novice at this, but how does this work? I’ve downloaded the ‘Find My Drone’ app on my iPhone. I own a Phantom 2 Vision Plus. What would be my next step? Are there instructions? it doens’t connect over WiFi to a Phantom, as the Phantom uses a different protocol. You can use ‘manual mode’ by going to the Settings App and selecting Find My Drone and flipping the Manual mode swicth. You can then enter in a Lat/Lon cooridinate of the last know position. I’m not sure how you would get that, unless you are using the telemetry with your Phantom. Wow,….. Bill you are a legend! this is just what the doc ordered. it was only about 2 months ago I had to send out my quad to find my hexi after a battery issue! I can think of many useful applications ! I am really looking forward to trying this out!